Tortoise slow motion switch machines and other similar screw-type turnout controls are great, but they are an expensive solution when you have a bunch of switches to install. Even twin-selenoid "snap" switches are expensive. Bill Payne, fellow Nottawasaga Model Railroad Club member, had been looking at other ingenious, cheap solutions to the problem, both for his own layout and the club modular layout. He built a small section of benchwork to test his ideas. 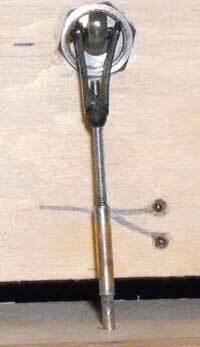 Bill had experimented with two ideas: using a choke cable designed for snow blowers and grass cutting machines, and bicycle spokes that have a threaded end. Subsequently he and I installed a topside miniature microswitch control on a handmade turnout. I'll explain all three approaches in case this gives you a way of solving your own installation problems. Previously, Bill had been involved with both model cars and boats and had picked up a number of tricks from the radio-control hobbyists. The most important, for our applications, is the use of linkages and collars to tie rods together. Here you can see the collar that connects the cable to the linkage that controls side-to-side movement of the throwbar. The choke cable is cut to the length necessary. A collar can be used to join two pieces to make the cable longer. The other end of the choke cable connects to a slide switch mounted on an L-shaped aluminum bracket. 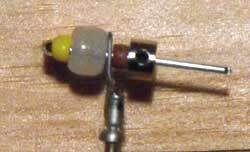 A collar connects the choke cable to a wire that hooks into a hole in the top of the slide switch. The collar grips the two wires firmly as it is tightened. The collar is also from the RC hobby shop. The choke cable collar ties the cable to the actuating rod from the slide switch. This is a closeup of the the threaded end of the bicycle spoke showing how it joins to the linkage. The linkage was bought at a store that sells radio-controlled (RC) models. For testing purposes the electrical wires are simply twisted together and are not intended to be a permanent solution. 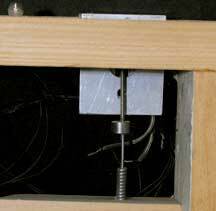 The throwbar linkage that passes through the plywood subroadbed is a piece of stiff wire in a tube. It is connected to the linkage by a piece of wire that is wrapped around both and soldered. 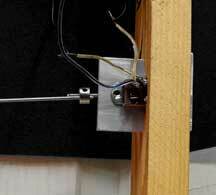 An Eshleman Turnout Switch Point Link could also be used if you don't want to make your own. Topside the linkage can be centered between the points or off to the side on the throwbar. One end of a bicycle spoke is threaded. The other end has a hook on it that you cut off to get the length of rod needed. The photo shows how the threaded rod connects to the linkage. The other image shows the other end of the bicycle spoke connected to the slide switch. It helps to have access to a milling machine to cut the correct sized slots for the slide switch. You could also achieve a similar outcome using masonite if working metal is beyond your capability. The contacts on the slide switch can power the frog of the turnout and panel lights. If you use a slide switch with one set of contacts (like the miniature micro switch pictured later in this demonstration) you would either use the contacts to power the frog or to power a relay that could then power other accessories such as dwarf signals and panel lights. For test purposes a nine-volt battery is used to demonstrate powering of panel lights and dwarf signals as well as the turnout's frog for power routing. The contacts on the slide switch power both the frog and dwarf signals paralleled with panel lights. 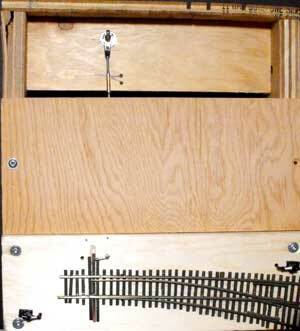 Our Nottawasaga Model Railway club layout is a traveling modular layout so it is important to avoid toggle handles or other parts protruding from the benchwork that could snag on people's clothes or get jarred by someone inadvertently. Therefore, the decision was made to recess the slide switches. To do this it is necessary to cut a hole in the face board or fascia. 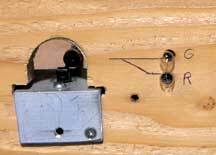 By trial and error Bill found that a 2-inch round hole was sufficient to allow a person's finger to push or pull the slide switch activating lever. The view above shows the holes in the front of the benchwork. Bill used grain of wheat bulbs to show in which direction the turnout was set. The choice of bulbs or LEDs would depend on what you want to use and how you want to power them. You could use the spare terminals on an inexpensive power pack or build your own power supply. Here the 12-volt bulbs burn dimly because they are only being powered by a nine-volt battery. Powering bulbs at less than their rated current will extend their life. A final installation would be much fancier, of course, with proper wire connectors and painted paneled fascia. The main point is that these methods work and most of the parts can be found in surplus stores. It also points out that it is a good idea to look at other departments in a hobby store for ideas that can help you build a better model railroad. Another problem we encounter with our modular layout is that the carriers that are used to transport the layout do not provide a lot of clearance underneath the subroadbed for turnout controls. The newer sections under construction are being made with hand-laid track and FastTrack turnouts. At a train show I saw a modeler demonstrating construction of these turnouts. He was using the leftover pieces of the FastTrack Twist Ties as a mounting surface for micro slide switches to activate the turnout's throwbar. Bill and I decided to experiment with a turnout that I had just constructed. We didn't mount it on cork but simply spiked it to a length of pine. We cut a small rectangle out of the Twist Ties scrap to clear the bottom contacts and hung it on the edge of the board. In practice, a hole would be drilled beside the turnout's throw bar that was large enough to clear the contacts. It could be slightly oversize to allow final positioning of the micro switch installed in its own Twist Ties plate (or a piece of styrene). As there is only one set of contacts you could choose to use them to power the turnout frog or to power a relay. 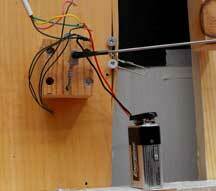 The main purpose of this experiment was to see if there was enough throw in the micro switch. We drilled a small hole sideways through the actuating lever and bent a length of fairly stiff brass wire to go from the lever to the throwbar. We had to gouge a small channel in the pine beneath the wire to allow free movement. 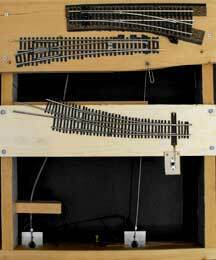 We found that there is just enough throw to move the points from one rail to the other on an HO scale turnout. An N gauge turnout would probably need a "Z" bend in a springier wire. S and O scale might work with larger slide switches, but we did not try to do this. Our experiments were restricted to HO gauge track. As we are building the HO turnouts by hand, it would be possible to narrow the gap slightly if we needed to in order to ensure the points firmly engage against each rail. There is also some leeway in the size of wire and the size of the hole that is drilled. We drilled a #56 hole and probably could have made the hole slightly smaller. We'll refine the method when we install the turnouts. The important thing is that we now know it works. We also thought the small handles on the slide switches could be disguised in the scenery by surrounding them with Woodland Scenics ground cover clumps or we could conceal them in battery boxes that could be lifted up when it was necessary to use the turnout. Those decisions still await us. An article in the Jan-Feb 2009 issue of N Scale Railroading inspired Bill Payne to try the author's approach. 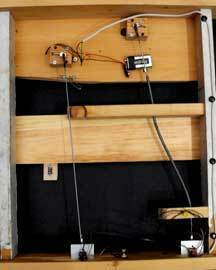 The author, Phil Brooks, called his method TATeR: Toggle Actuated Turnout Rig. The difficulty we face on our modules is that we can't have anything sticking out of the side panels of the carriers. Protrusions would interfere with loading the modules in the trailer we use to transport them. Also, we don't like things sticking into the aisles at train shows. The article describes using DPDT toggles to throw turnouts. Typical are the large ones from Radio Shack (model 272-1533). Again, parts used in radio-control are employed. The idea is to drill a hole through the handle and connect a clevis to the toggle. A threaded rod goes from the toggle to the actuating mechanism. The distance of the throw is controlled by using 4mm and 8mm plastic beads that can be bought at craft stores. It's easier to describe what we and the article's author did by using pictures. In this overview of Bill's test board, you see a typical HO turnout some arbitrary distance from the control toggle, and two dwarf signals. Bill decided to recess the actuating toggles below the top subroadbed. We could cut a round hole in the fascia to reach the toggle or we could cover the recessed area with a building. This is a closeup of the toggle. Bill flattened the handle to make drilling the hole easier. Then he attached a clevis attached to a threaded rod. The threaded rod goes into a brass tube. You'll notice he has also added indicator lights on the "control panel" for visual identification of the aligned route. This is the underside of the mockup. The DPDT switch allows for powering the frog and operating a lighting circuit. For test purposes Bill has hooked up panel lights and two dwarf signals powered by a 9-volt battery. He is powering the lights in parallel and is using mini-bulbs, not LEDs. You could use either, depending on the power supply. If the lights aren't lit, the turnout is not aligned. You could use a toggle that doesn't have a center-off position. This would eliminate the danger of derailments from a half open turnout. Here you see the end of the rod where it connects to the vertical spring wire that runs from the turnout down through a brass tube. The purpose of the bead is to adjust for the amount of throw needed. Bill used a center-off DPDT. In this way you center the rails with the DPDT in the center-off position. Then adjust the throw so the points will rest snugly against the rail when the toggle is moved. You can add another bead or use a smaller bead. It's a clever technique that Phil Brooks figured out. This method will also work if you use a flexible radio-control cable when you can't position the toggle perpendicular to the turnout. Other than buying some jewelry beads, Bill used what he had on hand in his "left over" drawer (he doesn't like to call it junk). Phil's article has a lot of explanatory pictures and suggestions. The important point, as Bill proved by duplicating Phil's experiment, is that the method is a practical solution for those who would like to build an inexpensive, manual turnout control. At our train club we are building a new HO layout and had to decide what to use for manual turnout control for Fast Track turnouts. We wanted to build our own to save money but did not want to go to the expense of powering them electrically with servos, Tortoises or other such machines. 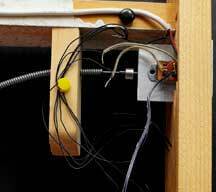 Member John Houghton devised a method that is quite ingenious: he uses the springs that Peco makes for their turnouts and installs them sandwiched between styrene and the bottom of the throw bar. The throw bars can be moved by finger pressure. 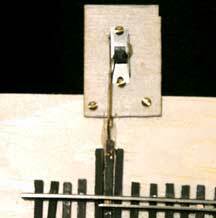 A switch stand can be mounted on the throw bar to indicate position or a short piece of wire can be mounted outside the rail if one doesn't want to have fingers operating the turnout from between the rails. Here is a pdf of John Houghton's detailed explanation of how to make a manual control for a Fast Track's turnout. Return from "manual-turnout-control" to my Home Page.